The Arctic sea ice is melting. It is melting far more rapidly than ever expected. This loss is measured in the form of square kilometers melted, in the form of ice thinned, in the form of new, blue water visible. Yet it is a loss beyond mere numbers and measures. A loss that has a profound impact to the Earth and its climate systems. Weather patterns, the rate of warming in the Arctic, the rate of tundra melt, seabed warming, and carbon store release. The rate of glacial loss in Greenland. All are impacted by sea ice loss and related ocean warming. And today, we mark another new record low. The most recent in a long series, with likely many more thinning ice days to come. Earlier this week there were indications that Arctic sea ice extent may begin exploring new record low values in the Wednesday through Friday timeframe. And the March 4 measure finds NSIDC values sliding below previous records for the date set just 8 years ago. Ever since Monday, extent values have been falling by an average rate of 10,000 square kilometers each day. A steady progression of warm air fronts through the Barents coupled with well above average temperatures in the Bering and near Alaska region have generated heat pressure along the ice edge and well into the Central Arctic. As of today, we have extreme temperature departures in the range of +20 degrees Celsius above average in the Barents northward through to the polar zone. From the Bering through Alaska and into the Southern Beaufort near the Mackenzie Delta departures are in the range of +5 to +20 C above average. These two hot spots, together with another warm pool over Greenland have shoved the Arctic, as a whole, into the +2 C range. A rather high departure that is only forecast to worsen in the GFS model summary over the coming days. The added warmth, wind, and waves in these ice edge regions drove these extent losses and now, as of Wednesday, values had fallen to 14,383,000 square kilometers. By comparison the previous record low for the day in 2006 was 14,411,000 square kilometers, so the new record is 28,000 square kilometers lower. An area approximately the size of the State of Maryland. 2011 now comes in as third lowest for the day at 14,451,000 square kilometers or 68,000 square kilometers above the 2015 value. Go back 30 years and the contrast is even more stunning with 1979 extent values for March 4 at 16,514,000 square kilometers. This places the new record fully 2,131,000 square kilometers lower than sea ice extent measures for the same date 36 years ago. 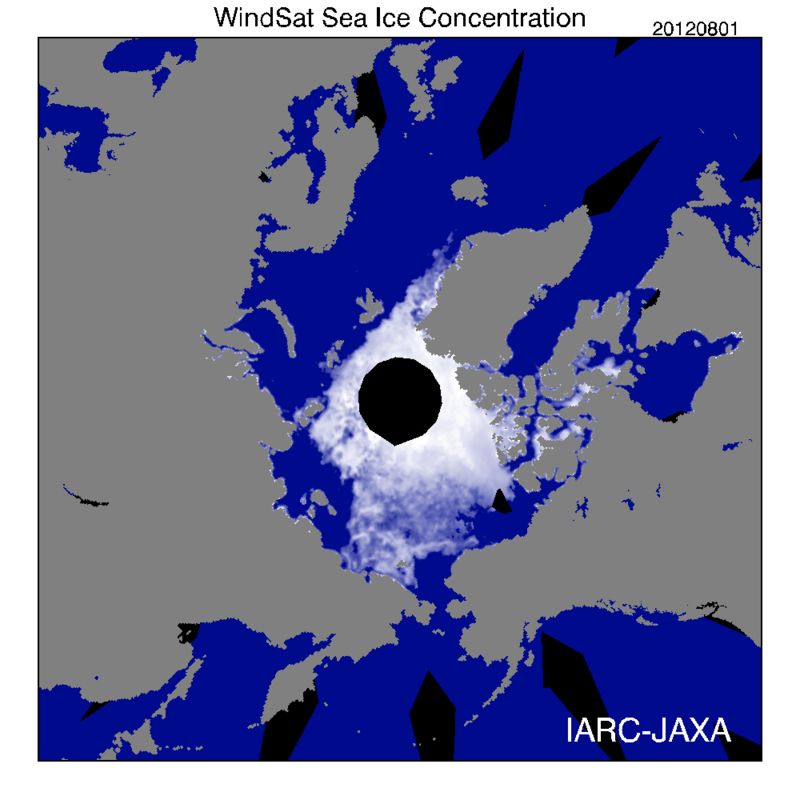 A total loss of ice coverage roughly equal to Greenland (2,166,000 square kilometers). But given the current time of year, a period where ice at low levels has tended to rebound, and given the fact that we are facing growing warmth in key ice edge regions, there is risk that record losses will continue to mount over the coming days. GFS forecast models show warm fronts continuing to advance along a very strong south to north wind pattern stretching across most of the Atlantic. 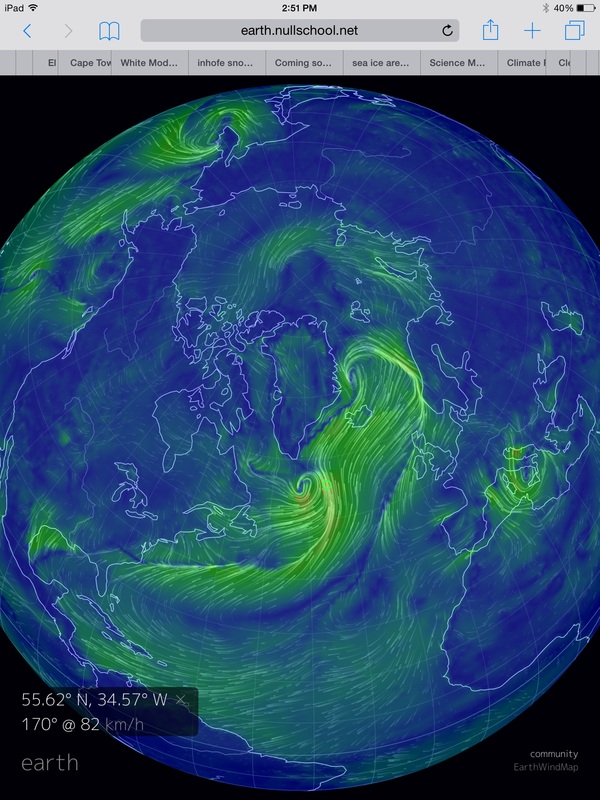 A wind pattern that today pulls tropical air off the underbelly of a high pressure system just north of Jamaica, funnels this warm air north and eastward over the currents of the Gulf Stream, dumps the flow into a raging low pressure (at 950 mb) just south of Greenland which then shoves the flow into a gale raging north of Scandinavia and south of Svalbard. A strong warm frontal boundary following in the wake of the most recent warm air invasion that, yesterday, swept past the pole. It’s a meridional pattern stretching from 20 North Latitude in the Tropical Atlantic all the way to 90 North Latitude at the pole. One that features a contiguous frontal boundary stretching from Yucatan Mexico to halfway between Svalbard and Iceland along a daisy chain of lows south and east of Greenland. A flow that is complicit in both melt along the borders of the Barents and ice thinning in the Kara and on past the 80 North Latitude line in the Arctic Ocean. This fire hose of warm air pouring up from the Atlantic will intensify over coming days as it fills the bowl of the Barents with heat, which GFS is predicting will balloon northward over the pole. By Sunday the temperature departures are predicted to peak in an extreme +4 C for the entire Arctic. Most of the heat fueling this departure will come from the warm air invasion over the Atlantic Ocean zone. A secondary, but also very intense temperature departure is predicted to emerge along the Jet Stream ridge pattern stretching to the Mackenzie Delta region. There temperatures will also show isolated spikes in the +20 C above the 1979-2000 average range. For the sea ice, such departures are very bad timing — hitting vulnerable regions hard just prior to traditional melt season start and possibly developing a rather low launching pad for the 2015 melt season. As such, there is high risk for continuing and expanding record lows for sea ice extent over at least the next five days. The most recent record lows and threat of these low measures deepening come amidst new scientific reports finding an ominous and extreme thinning of sea ice in the Central Arctic Ocean near the pole. The study found that between 1975 and 2012 Central Arctic Sea Ice thinned from 11.7 feet to 4.1 feet. Such thinning represents a loss of fully 65 percent of the sea ice volume for the Central Arctic Ocean over this period. 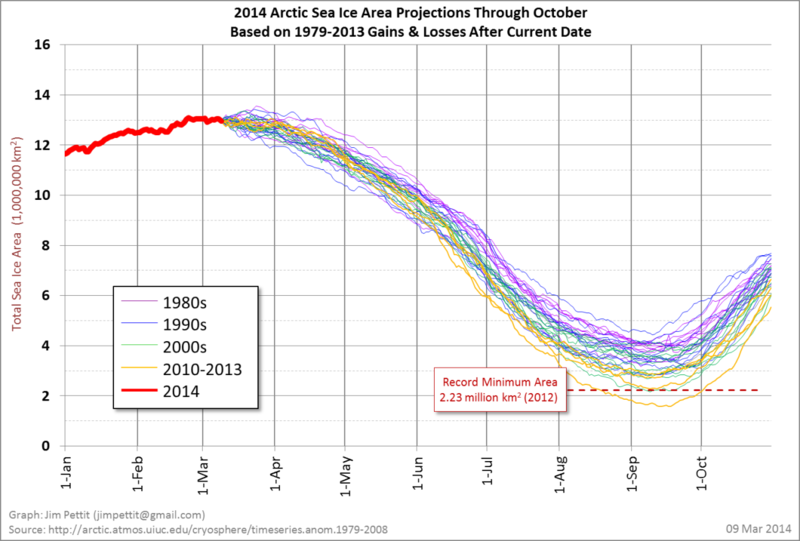 But yearly average sea ice thinning paled in comparison to losses seen during September. For that month, sea ice thickness plunged from 9.8 feet to merely 1.4 feet — a stunning drop of 85% over the 37 years of measurements. A 1.4 foot average sea ice thickness for September is very thin. Tissue paper thin when it comes to sea ice. And the 4.1 foot yearly average isn’t much better. A fragile skein vulnerable to the continued assault of elemental heat we keep driving into the Arctic. Given this major loss, noted fragility, and ongoing exploration of record low values, risks for blue ocean events in this region are on the rise. UPDATE: On March 5, 2015 new record extent lows deepened in the NSIDC measure. By that date extent measures had fallen another 25,000 square kilometers to 14,358,000. The drop deepens losses and widens the gap between 2006 (second lowest on record) and 2015 to 74,000 square kilometers — or an area roughly the size of South Carolina. Conditions — major heat build up along the ice edge zones, especially in the Barents region — continue to favor suppressed and reduced sea ice levels over the coming days. Updates on this evolving sensitive situation near the start of melt season will continue. Abnormal, warm southerly winds at the lower and upper levels. More large heat pulses driven by high amplitude Jet Stream waves. Tropical heat launching into the Arctic Stratosphere over the Himalayas. Warm water upwelling from the rapidly heating ocean depths. All conditions that continue to place the Arctic sea ice under a state of constant siege — winter and summer. All again doing their dangerous work in pushing the now critically weakened ice, once more to record low levels. Under this state of ongoing assault, regions near Svalbard fell into rapid retreat as floes fractured over warming waters in the Bering Sea and west of Greenland. The result is the lowest measure of winter time sea ice area ever seen in any record for this day since Arctic observation began. Yet one more passing milestone in the vicious and rapid progression of human-caused climate change. 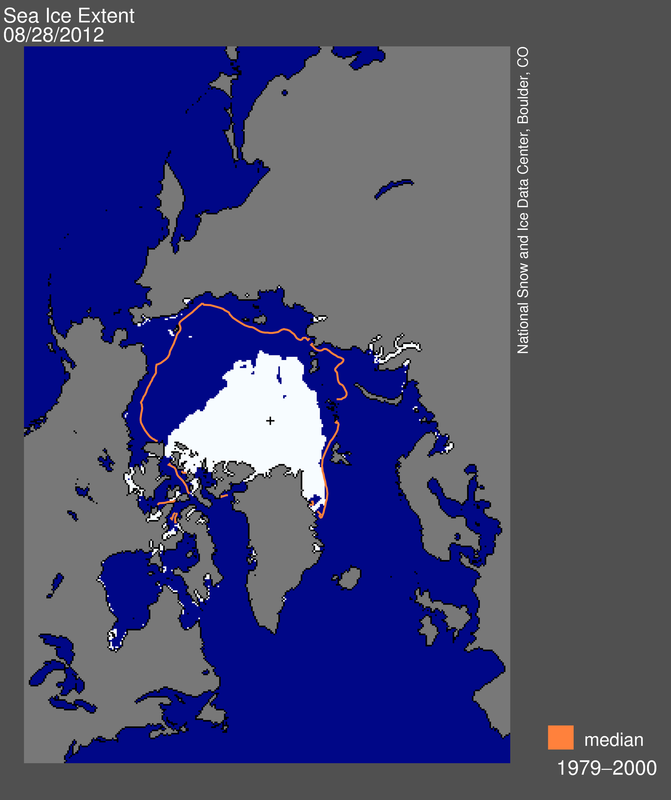 According to reports from NSIDC and Cryosphere Today, Arctic sea ice area dropped to a record low of 12.95 million square kilometers on March 10 of 2014. It is a measure more than 2 million square kilometers, or an area roughly the size of Greenland, smaller than that seen during the late 1970s and breaking the previous record low, set just three years ago, by 150,000 square kilometers. 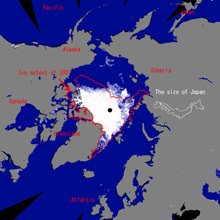 Sea ice extent, meanwhile, had fallen to 14.5 million square kilometers, a measure roughly tied with the previous record low set in 2011 and also about 2 million square kilometers below area values seen during the late 1970s. It is worth noting that the trend lines for both sea ice extent and area are well below previous trends for record low years 2007 (green below) and 2012 (pink below). 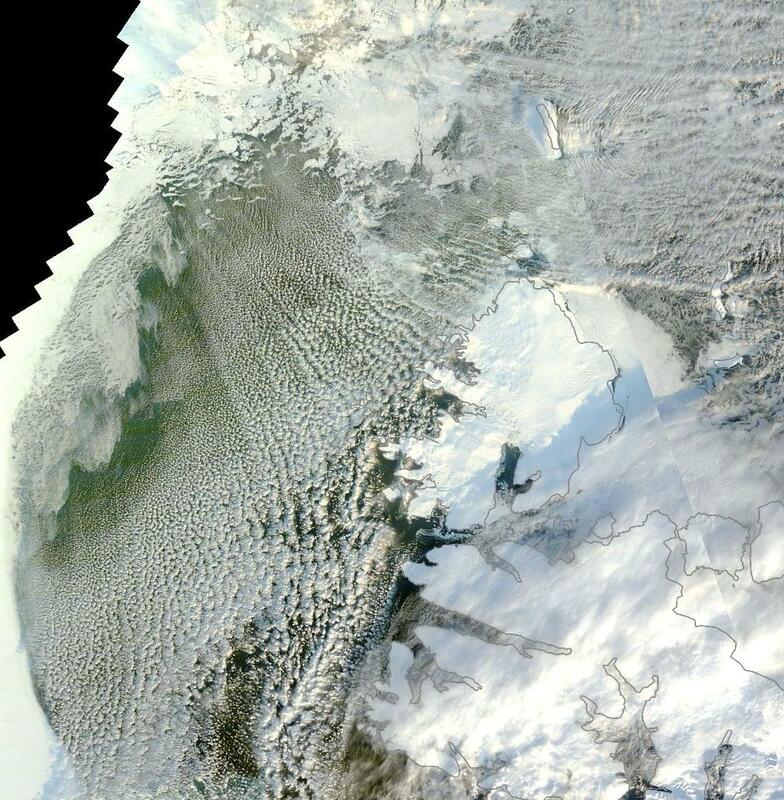 With the Aqua Satellite again cresting the Arctic, we can peer down through cloud and ice to see dark, open waters peeking through kilometer-wide cracks or dominating entire ocean zones during a very anemic peak freeze. With recent days bringing average Arctic temperatures in the range of 2.5 to 4.5 degrees Celsius above normal and with local spikes in the +20 degrees C above normal range, areas of visible retreat and fragility abound. A large region of northern Baffin Bay near Northwest Greenland and the Canadian Arctic Archipelago also showed extensive melt and open ocean zones during recent days. Over past decade, this region has shown increasing susceptibility to warm ocean water upwelling near the Nares Strait with winter-time melting of northern extremities in Baffin Bay. But this year’s melt was particularly strong. An event that coincided with sea-bed earthquakes and anomalously high methane levels (1950 ppb+) in the region through mid-to-late February. It is possible that upwelling is both driven by warm water currents now filling up the Baffin deep water zone and by the somewhat energetic out-gassing of sea bed methane through faults and seeps. It is worth noting that evidence of these seeps is based on satellite observation and very little in the way of comprehensive seabed methane assessment has been completed by the global scientific community, a gap in understanding that may well come back to haunt us as human-caused warming continues to put increased heat pressure on both deep and shallow ocean carbon stores. The current record low status for end winter sea ice and the approach of El Nino, which tends to add heat to the European and Asian continents, results in an increased risk that new record lows for sea ice area, extent and volume may be reached by end of summer 2014. Both warm air and water flushing in from the continents have been implicated in large sea ice retreats during recent years and a rapid heating of the large land mass over Arctic Europe and Asia, along with a simultaneous warming of Alaska, should El Nino progress, may amplify both continental heat build up and heat transfer through river outflow into the Arctic Ocean Basin. In addition, high temperature anomalies during late winter to early spring continue to suppress sea ice recovery late season. The result is that more open ocean is now available to absorb energy from the rising sun or to deliver that energy in the form of waves and currents to the greatly diminished ice pack. The one saving grace, if it can be viewed as such, is a minor, though likely temporary rebound in sea ice volume extending from late last year, likely bringing volume values into the range of 3rd or 4th lowest on record for March. It is also worth considering that sea ice area trends show an ever-increasing possibility of a record melt year with melt rates similar to 2007, 2011 or 2012 enough to bring 2014 to new record lows. In any case, this combination of conditions generates a high risk of sea ice reaching new record lows in sea ice area, volume and/or extent come end of summer 2014 (60%). This prediction finds its basis in observed records of past melt seasons and in the fact that very few days remain for a potential late-season uptick in sea ice. If record low values hold and a late season rebound does not occur, it is worth considering this simple fact: each time sea ice reached a new record low maximum sea ice area since 2005, a new record area melt was achieved by end of summer. That said, not achieving a record low maximum is no guarantee of safety, as 2012 so starkly proved. It is also worth considering that sea ice may be very close to tipping points and once thinned beyond a certain threshold will be unable maintain integrity. In such an event, warm, dark, increasingly mobile ocean waters eventually overwhelm an ice pack fighting for survival. We may well have seen the beginning of such a consequence during 2012 when powerful and energetic storms that would usually result in sea ice retention only served to hasten record losses. A warning that there are fewer and fewer conditions favoring summer ice retention as the Arctic energy balance is ever more forcibly shoved toward melt. Given these potentials — the high likelihood for record low area at maximum, the ever-lengthening melt season, and the increasing fragility of ice come end-summer — it is worth considering the unexpected worst case: total sea ice loss or near total ice loss (less than 1 million square kilometers area) by end of summer 2014. At this point, given record low area conditions late in the freeze season, we will assess a slight uptick of total ice loss risk over the previous year from 10 to 15 percent — a somewhat increased risk that sea ice values reach near ice free levels during a catastrophic melt this summer (15%). If an observed start to the melt season begins early and if melt rates rapidly steepen, we will likely reassess both the likelihood of new records at minimum and a potential ice-free end summer state in the face of increased risks. At this point, both measures are low confidence estimates based on trends analysis, observation of current unprecedented Arctic warmth, and continued fragile ice state conditions. March 11 Arctic sea ice area values showed continued decline into record low territory. March 10 to 11 area losses, according to Cryosphere Today, extended an additional 70,000 square kilometers pushing the value down to 12.88 million square kilometers over the entire Arctic. This level is about 130,000 square kilometers below the previous record low value for today set in 2011 at 13.1 million square kilometers. 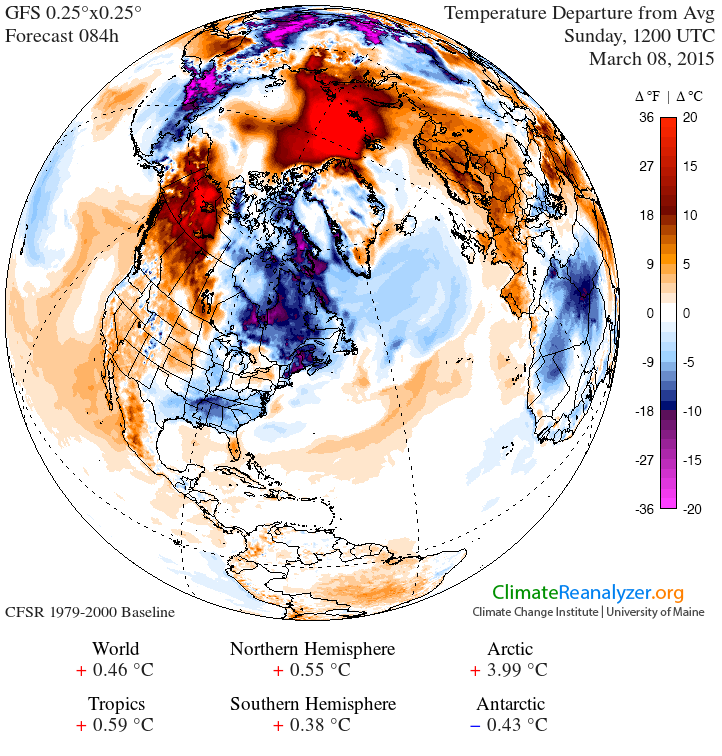 Abnormal atmospheric warmth over the regions most affected including north and east of Svalbard, Frans Joseph Land, the Kara Sea, a large region of Russia near Dickson, and in the region of the Nares Strait continued to provide melt pressure driving the most recent record low. Sea ice area anomaly fell to a new record low today as Arctic refreeze continued to lag normal seasonal refreeze. Today Arctic sea ice anomaly was 2,709,000 square kilometers below the 1979-2008 average. Today’s anomaly broke the record set yesterday by 4,000 square kilometers. Based on the current, somewhat slow, rate of refreeze, it appears possible that new record low anomalies will be set over the coming days. 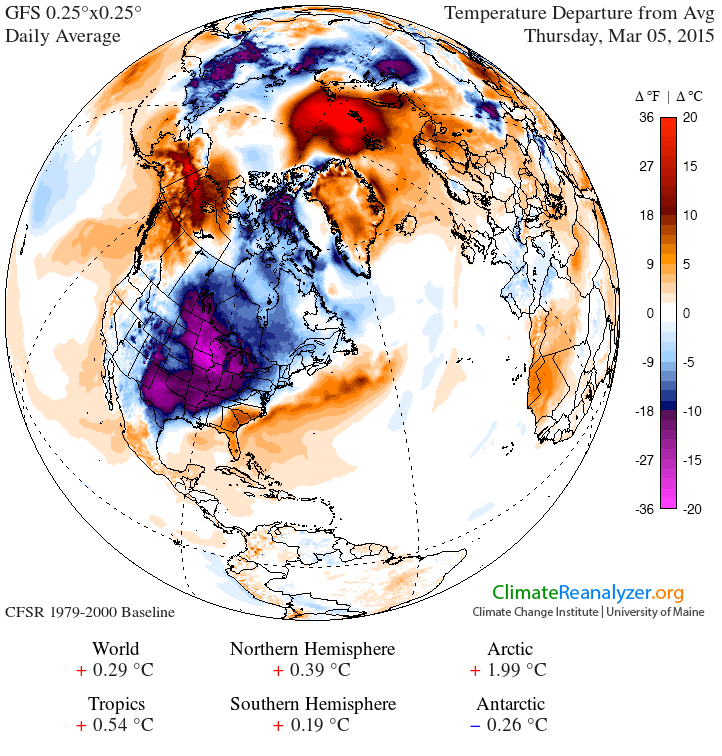 A high amount of latent heat in the Arctic appears to be fueling this phenomena. Temperatures range from 10-20 degrees Celsius above normal over a broad area. And, so far, refreeze has been slow to catch up to even the record low values set in 2007. However, with all this said, some extent measurements (a measurement that doesn’t include gaps behind the ice edge), are beginning to approach the extent measurements from 2007. What this shows is that the ice edge is advancing fast enough to begin to make up gains, but large holes remain behind the ice edge, showing that some of the refreeze is superficial and that record lows still hold in the region. Current rates of refreeze coupled with high Arctic temperatures would seem to point toward record or near record low ice area and extent for much of the remainder of this fall. According to the most recent update from the Polar Science Center, sea ice volume reached a new record low during August. This is the third consecutive record low since 2009 and the current low is 400 cubic kilometers below the previous record set in 2011. This new low is a 10% fall from the 2011 value. A total of 75% of sea ice volume has been lost since 1979. September usually marks the lowest volume measure for the year. So it is possible that the 2012 record is only preliminary and will fall lower as the melt season reaches its peak. As for this year, all measures of sea ice area, extent, and volume are in record territory. 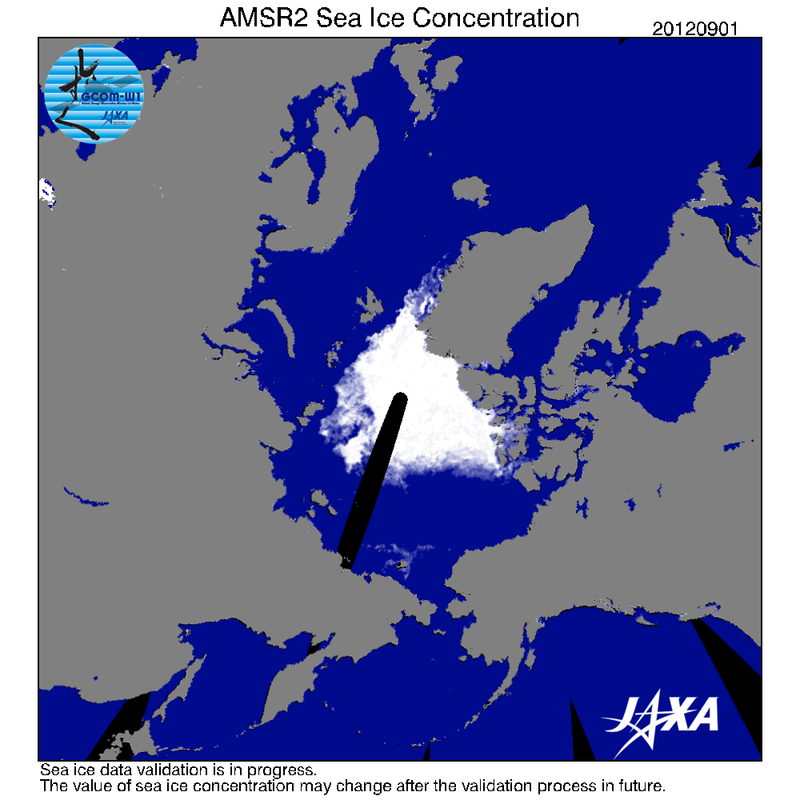 Current rates of loss show that ice-free or nearly ice free conditions are possible within the next ten years. Today Arctic sea ice extent continued its plunge into record territory. According to measurements provided by the Japanese Space Agency (JAXA), current sea ice extent for August 29th was 3,863,000 square kilometers. This value is 84,000 square kilometers below yesterday’s value and nearly 400,000 square kilometers below the previous record set in 2007. Arctic sea ice area melt also continued today reaching a new low of 2,570,000 square kilometers, according to reports from Cryosphere Today. This value is 420,000 square kilometers below the record low set in 2011. Over the past week, all values for sea ice area and extent have pushed to significant new lows. Given the current rates of melt, it appears possible that new records will approach or exceed 500,000 square kilometers below the previous record. By all measures this is a very significant loss of ice for one year. 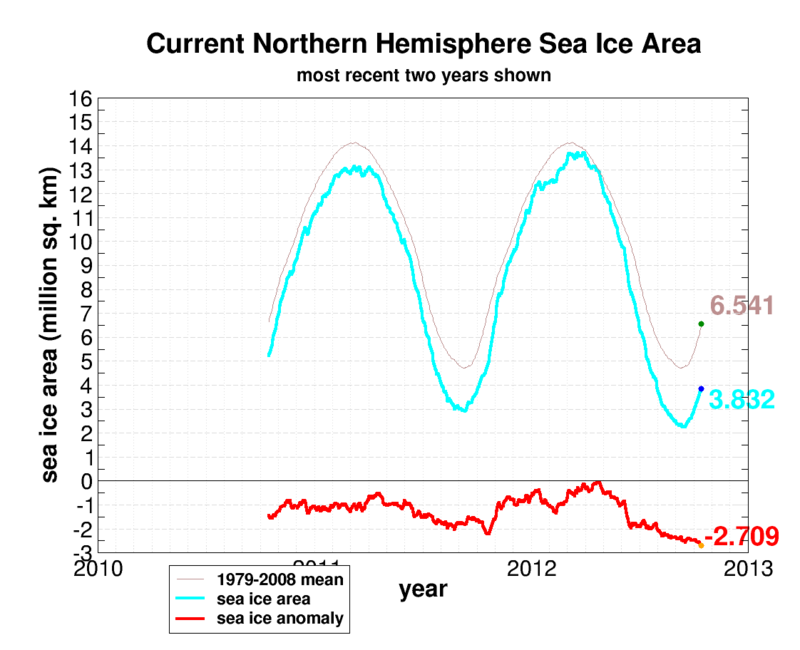 On August 24, 2012, the Japanese Space Agency showed a new record low for sea ice extent. 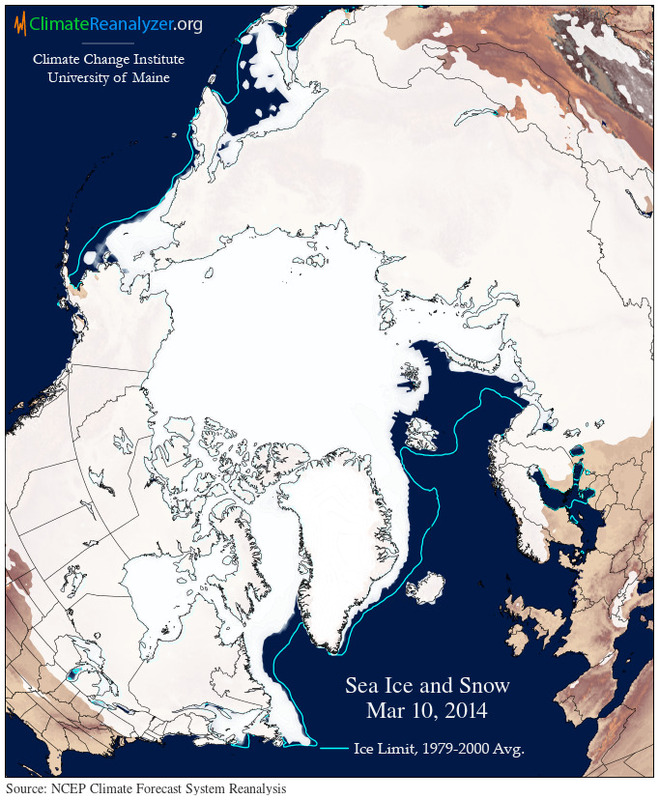 The next day, NSIDC and all other agencies measuring sea ice extent also showed record lows. In the above image, you can see a comparison between 2007 and 2012 for August 24th of this year. 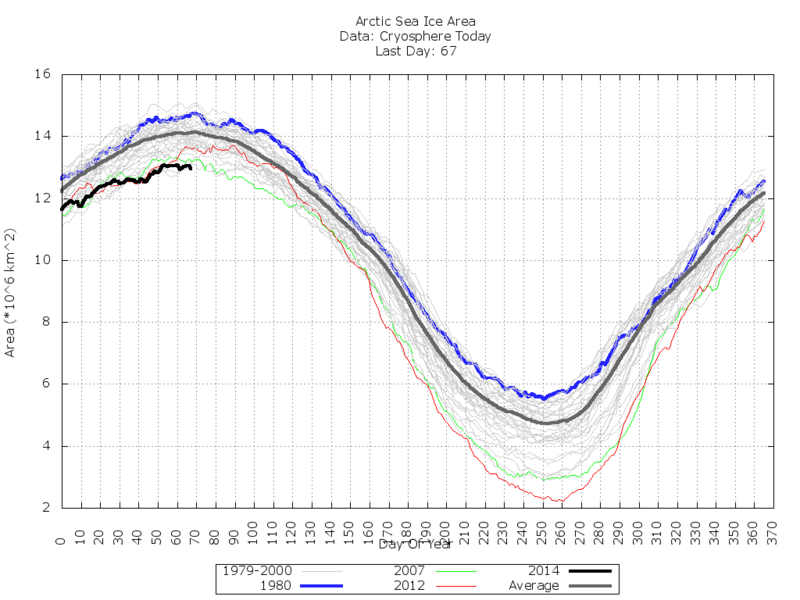 A week before, Arctic sea ice area also set a new record low. 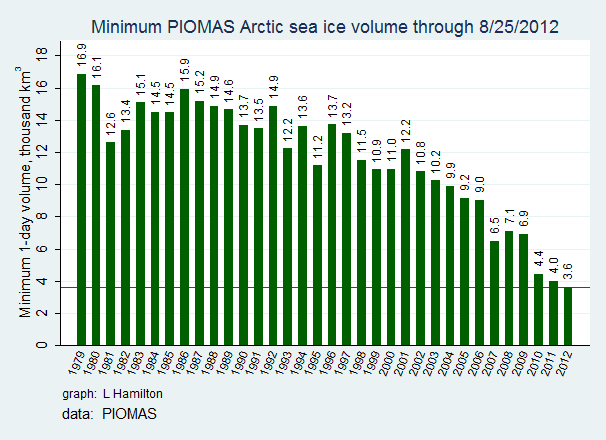 Sea ice volume measured by PIOMAS has yet to be recorded for August. But this measure is also likely to see new record lows when published. About two and a half weeks remain for the normal melt season, which usually ends around September 15th. 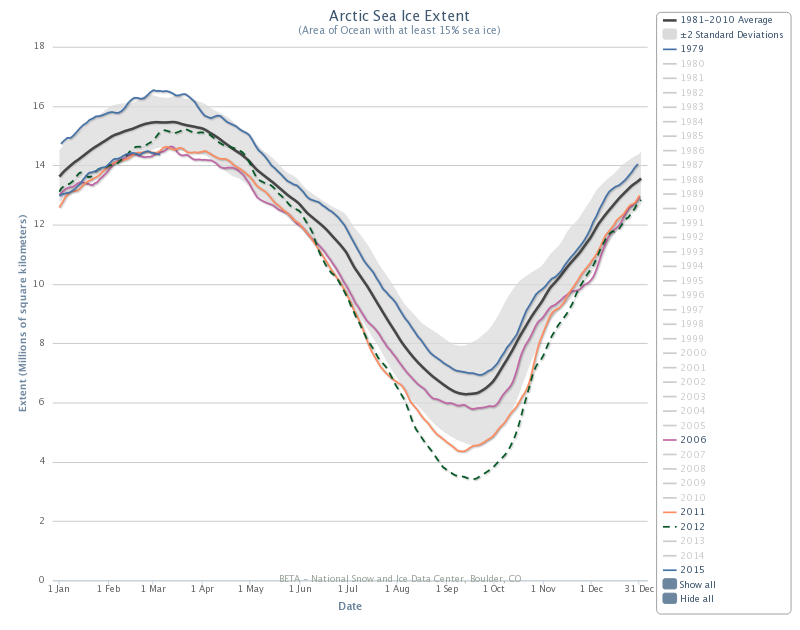 And since Friday we have continued to see melt in both sea ice area and extent. Today, sea ice area set a new record low at 2,643,000 square kilometers. This measurement is 262,000 square kilometers below the previous record low set in 2011. The Japanese Space Agency (JAXA) also continued to reach new record territory with sea ice extent showing 4,000,625 square kilometers. This value is more than 250,000 square kilometers below the record low set in 2007. On Friday, JAXA issued a statement predicting sea ice extent could fall below 4 million square kilometers before the end of this season. Given the rapid melt since Friday, it seems likely that sea ice extent could fall below 4 million square kilometers by tomorrow or the next day, and perhaps far less by the middle of September. It is worth noting that melt for the 2007 record year ended nearly ten days later than during a normal season. 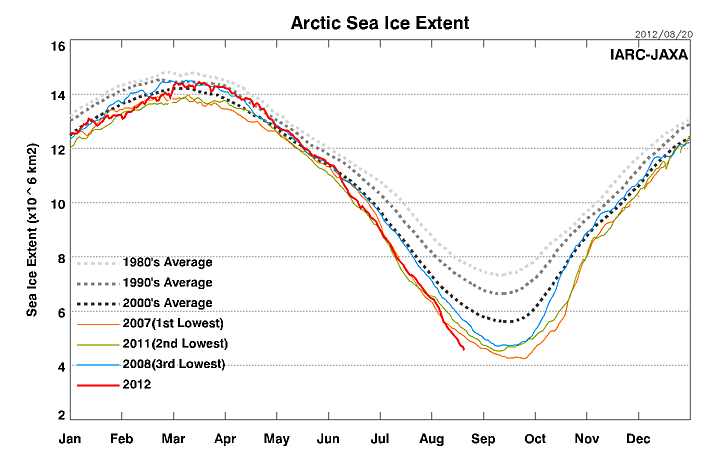 So it is possible that 2012 will also extend melt beyond mid-month. Though the pace of sea ice area melt has slowed, indicating some consolidation of the ice sheet, sea ice extent measurements have plummeted at an average rate of about 80,000 square kilometers per day for the past few days. With both area and extent pushing into new record territory almost daily, we can reasonably expect new lows beyond the values currently seen. Best estimates for new sea ice area lows are in the range of 2.1 million square kilometers to 2.6 million square kilometers and 3.6 million square kilometers to 4.0 million square kilometers for extent. The rates of decline for the Arctic this year have been startling for many reasons. Not only has melt far exceeded that seen in 2007, it has also occurred during periods of weather that wouldn’t normally result in a rapid melt. This result shows that Arctic sea ice has grown very fragile. This apparent fragility has become clearer even as more scientists note the possibility for ice free periods in the Arctic within 10 years, 20-30 years sooner than even the most rapid forecasts and as much as 90 years sooner than the more conservative models. These results are, indeed, startling and will require further explanation in another blog. The above headline is one you should see on the front page of all newspapers around the world. 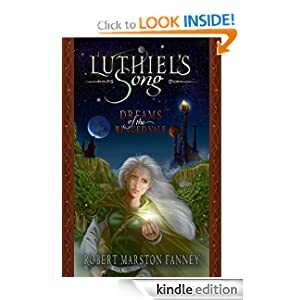 It is more important than the sinking of the Titanic, more dreadful an omen than Germany’s invasion of Austria at the onset of World War II. It is a sign of worse things to come. And, yet, the US is asleep. Lulled by false assurances of safety, trapped in a nearly impenetrable bubble of electronic entertainment. But, regardless of who is listening or paying attention to these historic events, today is a day that will go down in the record books. For today the previous extreme record low for sea ice area, a record low the experts predicted would not be reached in another 20 or 30 years, was shattered. According to reports from Cryosphere Today, current sea ice area falls at 2,877,000 square kilometers. 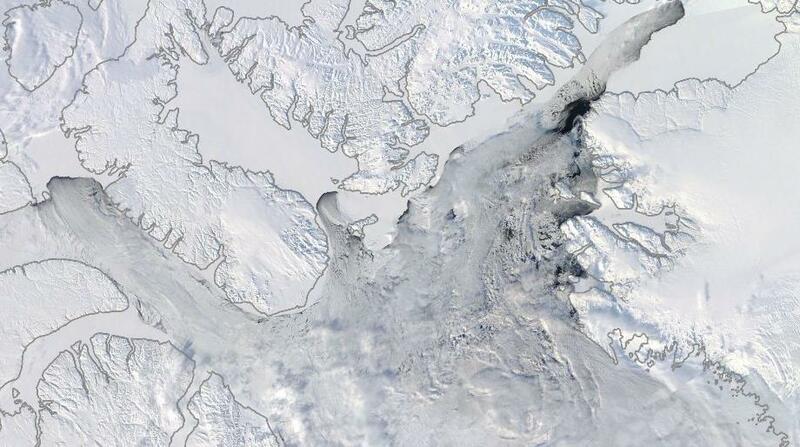 This is 28,000 square kilometers below the previous record lows set in 2007 and 2011. A new record all-time low has been set today. But this low is likely to stand for only another day or two. Why? Because weather conditions favor continued melt and because we still have about three weeks of melt remaining for this year’s summer melt season. 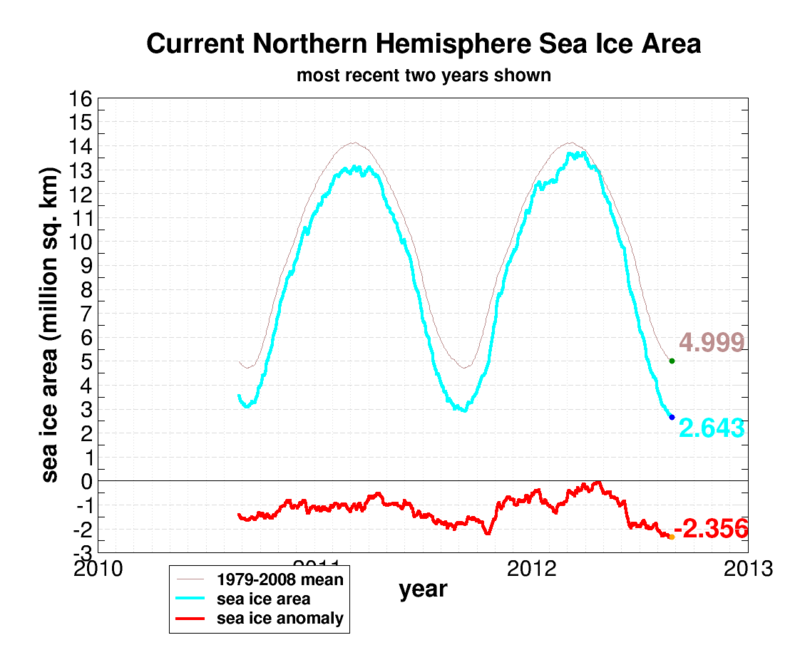 Unprecedented is the best word to describe what is happening to the northern sea ice. No model has predicted such a rapid fall. This event is as freakish as a blizzard in the Sahara Desert at the height of summer. Yet, this particular unprecedented weather event is happening with greater intensity as the years pass, establishing a growing trend of weirdness the likes of which the modern world has not seen. And it is human-caused climate change that has made mince of both our models and our sea ice. The sea ice is important. Important for its insulating properties. Important because it reflects sunlight, helping to keep the Earth cool. Important for its climate and weather moderation properties. Important for the species of fish and wildlife that thrive under and upon the ice. All these values are important for humans as well. And we are losing them at an increasingly rapid pace. 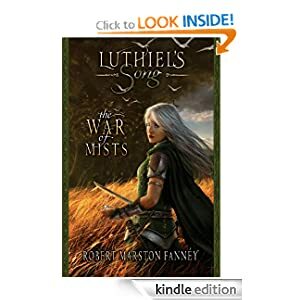 If Germany’s invasion of Austria was the date that Europe lost its reason to hope for security against the prospect of foreign invasion, then today was the date that the world lost any reasonable assurance of climate security. In short, the next decade and the ones to follow will bring with them a cavalcade of troubles not yet seen by modern civilization. We will see continued sea ice decline. We will see continued global warming. We will see continued softening of the Greenland ice sheet. We will see intensifying instances of extreme weather. And we will almost surely witness an increasing pace of sea level rise. Likely, we will witness extreme or even catastrophic events which we currently have no ability to predict, because there is no steady-state basis for the climate we are, at this very moment, experiencing. Nature could not give us a clearer call that a redoubling of efforts is needed. We could not have received a more clear signal that the time for turning away from fossil fuels, if it was not yesterday, is today. 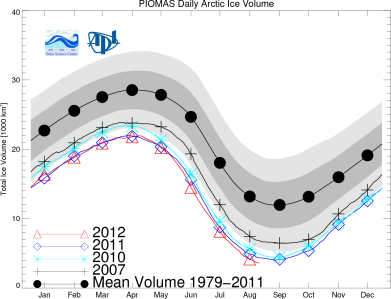 Sea ice volume is also currently tracking for a substantial new record low. This conforms to the trend of the last five years, where each consecutive year saw a new record low reached for sea ice volume. The terminal decline of sea ice is a dire situation which requires swift response. We may not be able to prevent summer loss of sea ice cover, but we might, if we act swiftly and with purpose, be able to prevent the more damaging and devastating losses to the Greenland ice sheet. For after a fall in Arctic sea ice, the land-bound ice of Greenland is next on the chopping block. And the consequences of rapid melting to this ice mass will be much more drastic for human civilization. As for the canary of our last blog — the prognosis isn’t looking too good.